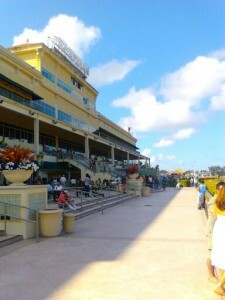 Bettors will return to live racing Thursday at Gulfstream Park with a 20-cent Rainbow 6 carryover of $637,676.94. There was no single winning ticket Sunday for the 22nd consecutive race program. Multiple tickets with six winners returned $2,342.44. Racing resumes Thursday with a 10-race program beginning at 1:15 p.m. The Rainbow 6 sequence kicks off with the fifth race, a maiden claiming event going six furlongs on the main track. Anthony Oppenheimer’s 4-year-old Coronation Cup (G1) winner Cracksman (GB) will likely be a substantial favorite when he faces six rivals on Wednesday in the 1 ½-mile, $750,000 Prince of Wales’s Stakes (G1) at Royal Ascot for an automatic berth into the Longines Breeders’ Cup Turf (G1) through the international Breeders’ Cup Challenge. The Breeders’ Cup Challenge is an international series of 82 stakes races, whose winners receive automatic starting positons and fees paid into a corresponding race of the Breeders’ Cup World Championships, which will be held at Churchill Downs in Louisville, Kentucky, Nov. 2-3. Wednesday’s race is the second of four Breeders’ Cup Challenge “Win and You’re In” races to be held at Royal Ascot this year. The Queen Anne Stakes (G1), which gives the winner a free berth into the Breeders’ Cup Mile (G1) will be run on Tuesday. 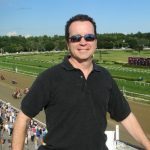 On Thursday, June 21, the Norfolk Stakes (G2) will offer the winner an automatic starting position into the new Breeders’ Cup Juvenile Turf Sprint. The Diamond Jubilee Stakes (G1) on Saturday, June 23, provides the winner an automatic berth into the Breeders’ Cup Turf Sprint (G1). As a part of the benefits of the Challenge series, the Breeders’ Cup will pay the entry fees for the winner of the Prince of Wales’s to start in the Breeders’ Cup Mile. Breeders’ Cup will also provide a $40,000 travel allowance for all starters based outside of North America to compete in the World Championships. If not Breeders’ Cup eligible, the Challenge winner must be nominated to the Breeders’ Cup program by the pre-entry deadline of October 22 to receive the rewards. Cracksman, trained by John Gosden and ridden by Frankie Dettori from post, 2 is the No. 3 rated horse in the world behind Winx (AUS) and the retired Gun Runner in the latest IFHA Longines World’s Best Racehorse rankings. The bay son of Frankel (GB) out of the Pivotal (GB) mare Rhadegunda (GB), has won five consecutive races, and further punctuated his prowess with a determined stretch drive in the 1 ½-mile Investec Coronation Cup at Epsom on June 1, collaring Salouen (IRE) at the wire to win by a head over soft ground. The Coronation Cup was Cracksman’s second win in as many starts this year. He opened the season in France on April 29 with a dominant four-length score in the 1 5/16-mile Prix Ganay (G1) at Longchamp. Gosden has won the Prince of Wales’s three times, training back-to-back victories with Muhtarram in 1994, ’95, and again with The Fugue (GB) in 2014. Cracksman completed his 2017 season with a stirring triumph in the 1 ½-mile QIPCO Champion Stakes (G1) at Ascot on Oct. 21, defeating Poet’s Word (IRE) and Highland Reel (IRE) by seven lengths. Prior to that, Cracksman won the Prix Niel (G2) at Chantilly and the Betway Great Voltigeur Stakes (G2) at York last August. 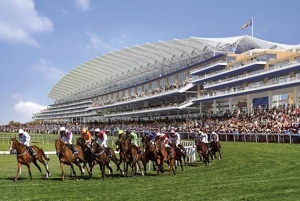 Poet’s Word, trained by Sir Michael Stoute for Saeed Suhail, comes into the Prince of Wales’s off 2 ¼-length win in the 1 ¼–mile Matchbook Brigadier Gerard Stakes (G3) at Sandown on May 24 as the odds on favorite over five rivals. Prior to that, the 5-year-old bay son of Poet’s Voice (IRE) was second by three lengths to Hawkbill in the 1 ½- mile Longines Dubai Sheema Classic (G1). Poet’s Word has won five race in 14 career starts, which includes the 1 ½ mile Betfred Glorious Stakes (G3) at Goodwood last August. He will be ridden by James Doyle from post 2. Hawkbill’s win in the Dubai Sheema Classic was his seventh career victory. Owned by Godolphin and trained by Charlie Appleby, Hawkbill (post 5, William Buck), a Kentucky-bred son of Kitten’s Joy, has won two of his three starts this year. He captured the 1 ½-mile Dubai City of Gold (G2) at Meydan on March 10 by a head over stablemate Frontiersman (GB). He did not fare well in his most recent start, the Coronation Cup, where he was not a factor in fifth-place finish. Hawkbill was bred by Helen K. Groves Revokable Trust. Trainer Aidan O’Brien won last year’s Prince of Wales’s with the globetrotting, multiple-Group 1 winning Highland Reel (IRE). This year, O’Brien has entered Mrs. John Magnier, Michael Tabor, Derrick Smith and Markus Jooste’s Cliffs of Moher (IRE) (Ryan Moore, post 1). A 4-year-old bay son of Galileo (IRE), Cliffs of Moher finished second by two lengths behind stablemate Lancaster Bomber in the 1 5/16-mile Tattersalls Gold Cup (G1) at The Curragh on May 27. Cliffs of Moher, second in last year’s Investec Derby (G1), came into the Gold Cup off a 1 ¾ length victory in the Group 2, 1 ¼-mile Mooresbridge Stakes at Naas in Ireland on May 7. Sir Peter Vela’s 4-year-old Eminent (IRE), (Oisin Murphy, post 4), third in last year’s Irish Champion Stakes (G1); Abdullah Al Mansoori’s 6-year-old gelding Desert Encounter (IRE) (Jamie Spencer, post 3), winner of last year’s Dubai Duty Free Legacy Stakes (G3) at Newbury and Mme Jade Prescillia Angelini’s Royal Julius (IRE) (Gerald Mosse, post 7), winner of the Group 2, 1 1/8 mile Presidente della Repubblica at Capannelle in Italy on May 18, complete the field. The Prince of Wales’s Stakes will award the third automatic berth into the Longines Breeders’ Cup Turf this year. The first two to qualify were the filly La Extrana Dama (ARG), who won the Gran Premio 25 de Mayo (G1) at San Isidro in Buenos Aires, and Quarteto de Cordas (BRZ), who captured the Grande Premio Brasil (G1) at Gavea in Rio de Janeiro.